FairPay turns many conventional ideas about pricing on their head, to the extent that many people don't fully appreciate some of its key features on first look. (FairPay is the radical new pricing process introduced in the sidebar of this blog, and the companion Web site). FairPay processes moves forward in ongoing cycles of transactions, but for each transaction cycle, the pricing decision looks backward. FairPay price-setting is retrospective. Conventional prices are set before the buyer uses the product or service. With FairPay, the buyer sets the price after using the product or service. Setting the price before use exposes the buyer to risk of "buyer remorse" -- The buyer can only guess whether the value received will be as expected. So, setting prices forward (as is conventional) requires the buyer to take a leap of faith. As a result, the buyer must build a discount into what he is willing to pay, to compensate for the risk of a value surprise. Depending on the nature of the product, this risk (and the attendant discount) might be significant. That is especially true for "experience goods" like music, movies, etc., and that can significantly reduce their potential market -- buyers often will not take the risk. It also is significant when dealing with unfamiliar (untrusted) sellers for any kind of good. Even with many basic forms of Pay What You Want, pricing is forward (even if set by the user). So up-front price-setting depresses PWYW results, since it leads buyers to set prices lower than they might do after the value was confirmed. By setting prices backward, after the product or service has been used, the buyer has no risk of that kind of remorse. They know what they got and what value it delivered, so they can set their price based on that full value. Think about it: after you saw a great movie or played a great album several times, wouldn't you consider paying significantly more than the standard price for a typical movie or album? Or with a poor movie or album, aren't you sorry you paid what you did, and wishing you could get a reduction or refund? FairPay is forever. 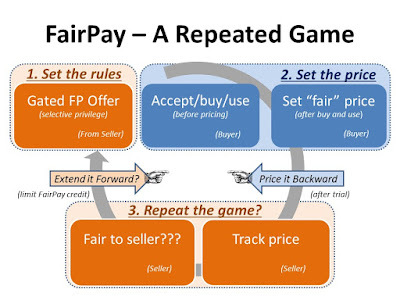 FairPay is not just a temporary negotiation stage that leads to a fixed price after one or a few cycles. Of course it could be cut short, but generally that seems undesirable. Value considerations change over time. The beauty of FairPay is its ongoing adaptation, so why cut that short? The buyer's usage or needs may change, so their pricing should be allowed to change accordingly. The seller's product or service may vary in quality and value, with periods of reduced value or evolution toward higher value, so, again, pricing should vary accordingly. 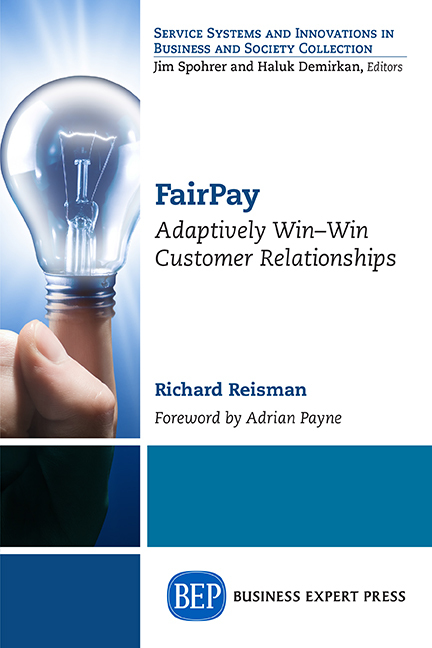 Why not let the adaptive process inherent in FairPay do its work to adjust for that? In its pure form it works in repeating cycles of an ongoing relationship, and that continues indefinitely -- as long as both sides view it as fair. 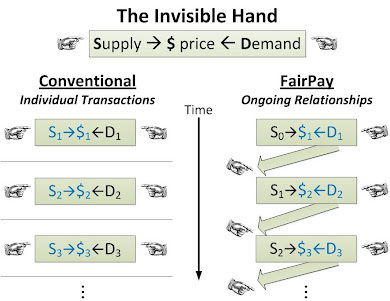 Of course this is not an absolute -- FairPay is a just a process framework that can be adapted and used in hybrid forms as the situation warrants, but in general, it seems that there is little reason not to continue it. So FairPay really is Pay What You Want -- except that it looks over your shoulder to encourage you to Pay What You Think Fair (even if you might have been tempted to be unfair). You still pay whatever you want, you just are given strong motivation to be fair about it. FairPay is not a price negotiation (at least in pure forms). It is also easy to misunderstand the basic idea of these cycles. FairPay has similarities to a negotiation process, in that it creates a two way dialog about price, but (at least in its pure form) it never leads to a set price that goes forward. For each cycle, the price set is always a retrospective price, set by the buyer after using the product/service during that transaction cycle. Each cycle is open to a new PWYW evaluation by the buyer. The seller might react to a seller's tentative (retrospective) price and advise that if the buyer prices at that level, the seller will next extend offer, X1, but if the buyer sets a higher price (for the transaction that is ending), the seller will extend a more attractive offer, X2 (perhaps including premium items, or some other perk),for the following cycle. Similarly, if the tentative retrospective price is considered unfair by the seller, the seller might advise that no further offers will be extended based on that price, but that if the buyer changes the price to Y, then further offers will be made. The idea is to give the buyer the freedom to set the value as he sees fit, but to enable the seller to provide guidance on how he will view that, as it relates to further offers in this continuing relationship. The buyer has full control of the price -- what the seller controls is whether the relationship will be allowed to continue on that basis. But remember, the price remains retrospective. The buyer is still free to pay whatever he wants during the next cycle. What is negotiated is not the price for the next cycle, but the price for the previous cycle that will motivate the seller to offer a next cycle.